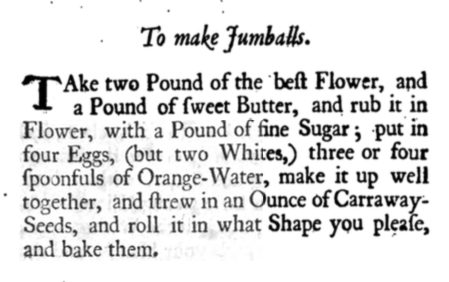 The following recipe comes from a collection of recipes found in a manuscript journal located in the H. Furlong Baldwin Library at the Maryland Historical Society in Baltimore. The manuscript is attributed to Ann Maria Morris and the date of 1824 is written on the inside cover. The recipe below is one of many from the manuscript that will be included in a book I am writing. The book will contain biographical information about Mrs. Morris, an annotated transcript of the entire manuscript as it was written, and a section of modern recipe adaptations. 3 lbs. flour, 2 lbs. of butter, 2 lbs. 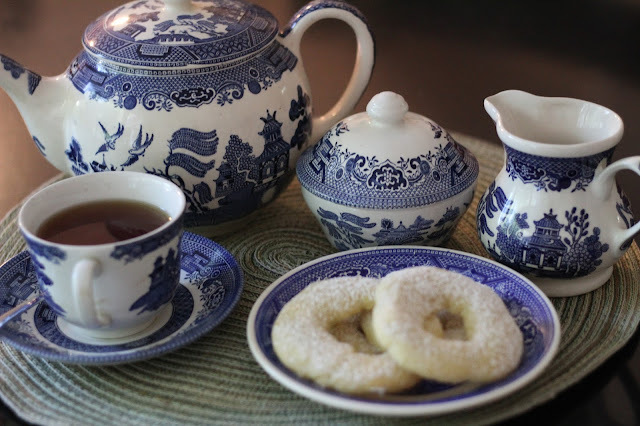 of Sugar, 6 eggs well beat, 6 spoonfuls of rose, or peach water; then rolled in sifted sugar. 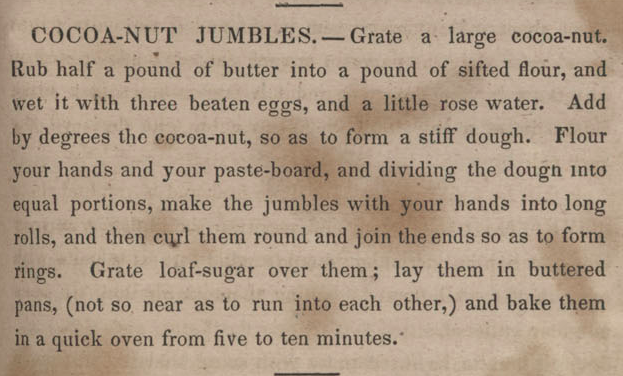 Spread them on a buttered paper and bake them in rings in a gentle oven. 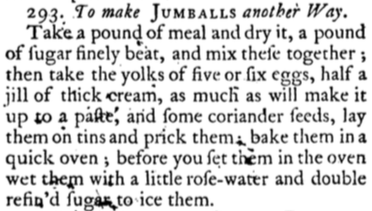 Jumbals, or jumbles as they are more commonly spelled, are a type of sweet biscuit/cookie that goes back to 17th century England. 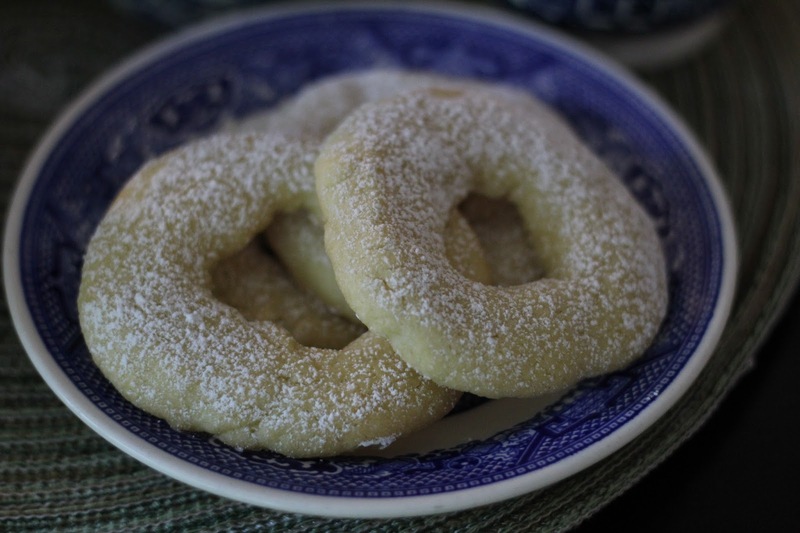 The recipe for them is similar to that of an American style sugar cookie. What makes these unique is that they were historically shaped in knots or rounds. 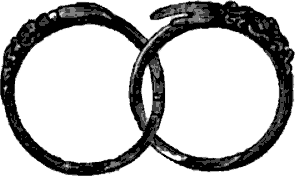 The name itself is a corruption of the term gemmel, referring to a double intertwined finger ring. This term is most likely derived from the Latin word gemellus for twin and the old French word gemel for twin. In a large mixing bowl, combine the butter and sugar. Add the egg yolks and flavoring and mix with an electric mixer until light and fluffy. Wrap the dough in 4 separate parcels in plastic wrap and refrigerate for at least 60 minutes. While the dough is resting, heat the oven to 350º F.
On a floured surface, shape the dough into 6-8 inch long logs and then shape into circles or twists. Dust with confectioner's sugar. Serve warm or cold. Davidson, Alan. The Penguin Companion to Food, New York, 2002.